A baccalaureate degree in nursing is the minimum requirement for nursing registration with the College of Nurses of Ontario. Conestoga College, Mohawk College and McMaster University are working together to meet this requirement. Through this consortium arrangement, Conestoga College offers nursing curriculum leading to a Bachelor of Science in Nursing (BScN) degree. Students accepted to Conestoga's BScN program will take all four years of study at the Doon campus in Kitchener. Graduates of the program will receive a degree from McMaster University. - an offence under the Narcotic Control Act (Canada) or the Food and Drugs Act (Canada). This is a highly competitive program. Apply by February 1 (for September). Applicants applying directly from Ontario secondary schools must apply with the completion of the Grade 12 U or M course requirements with a minimum 75% cumulative average and have not attended any post-secondary educational program. Transcripts from institutions previously attended must be submitted to the College. Failure to do so may result in rescinding an offer of acceptance. Applicants who have attended university must submit all university transcripts. This includes all Canadian and international universities. Failure to do so will result in withdrawal of the offer of admission. The university transcripts WILL BE used as the basis of admission. Applicants must achieve a cumulative average of at least B- (70%) in all university degree credit courses taken. A minimum of 12 units or equivalent are required. (These courses may be taken as a full-time or part-time student. University correspondence degree courses are acceptable.) University degree credit courses completed prior to admission will be assessed for advanced credit following admission to the program. Applicants who have successfully completed a one-year pre-health sciences program (no exemptions or equivalencies) at an Ontario College of Applied Arts and Technology (CAAT) will be considered for admission to Level I of the BScN program at all sites. The program must include two terms (two credits) of biology, chemistry, mathematics, English and two other courses and achieve at least a 75% in each of the biology and chemistry courses and a cumulative average of 75% in the entire pre-health sciences program. PLEASE NOTE: Applicants who have attended university cannot use the pre-health sciences program as their basis of admission. The one-year pre-health sciences program is the ONLY college program that meets admission requirements for this degree program. Applicants to the BScN program using a pre-health sciences program as the basis for admission should be aware that the full pre-health sciences program (no exemptions or equivalencies) should be completed in the year immediately prior to the applicant's anticipated start date in the BScN program. Note: Transfer credit will not be granted for any pre-health sciences courses. Each student granted admission must be proficient in the use of the English language. Students will be expected to speak and write clearly and correctly in English. Resided in an English-speaking country for at least four years immediately prior to application to Conestoga. It is your responsibility to make all arrangements regarding the writing of any English language proficiency test and to have the official score report forwarded to the Office of the Registrar in a timely manner. Academic strength is calculated by averaging all submitted Grade 12 marks (or equivalent) of the required subjects and two additional U or M courses. If more than two additional courses are submitted, the courses with the highest marks will be used. Final selection is made using a formula that combines academic strength with the score on the CASPer™ assessment. Please note, offers for this program will not be going out until all CASPer test results have been received and mid-term grades from high schools have been submitted which will be by early May. A complete immunization record including MMR, Tdap, varicella, polio and hepatitis B. Seasonal flu vaccination is required during flu season (October - March). TB Testing: Evidence of current 2-step or previous 2-step + current 1-step if more than one year has passed since 2-step testing. An annual Police Check for Vulnerable Sector Screening (VSS). Police Checks must be clear of any unpardoned criminal offences. An unclear criminal record may result in the inability to participate in field placement/clinical which will jeopardize progress in the program. Acceptance for placement is at the discretion of the agency; some agencies may request students to provide a VSS completed within six months of placement start date. Students with criminal records are advised to meet with the program chair for academic counselling to determine program suitability. In addition, students are responsible for costs associated with respirator fit testing required for clinical practice. International fees are currently unavailable; please check back at a later time. 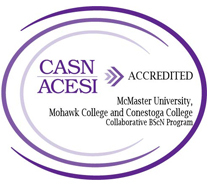 Upon receiving the BScN degree from McMaster University, graduates are eligible to write the National Council Licensure Examination (NCLEX). The College of Nurses of Ontario (CNO) requires all applicants for registration to provide a recent criminal record synopsis (CIPC check) as part of the RN registration process. If you have any questions related to the Regulated Health Professions Act, please contact the College of Nurses of Ontario directly at 1-800-387-5526. For more information about the curriculum for the BScN program, please refer to the McMaster website.